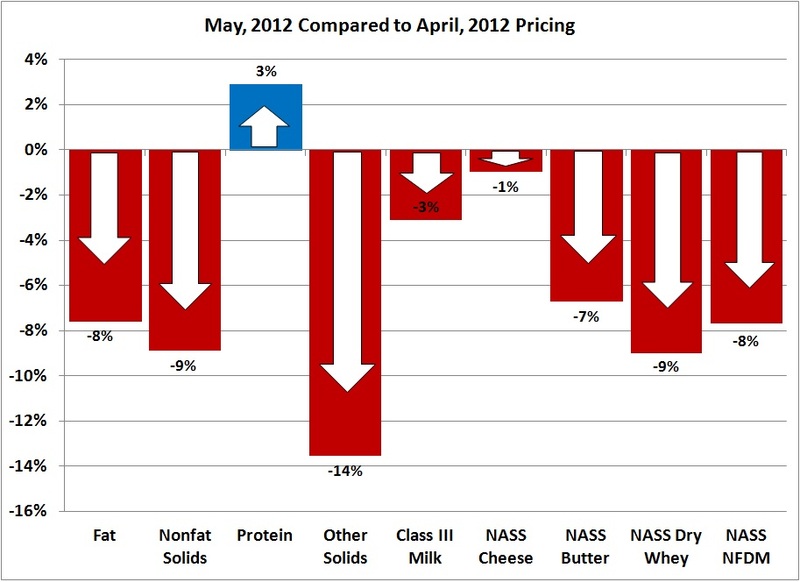 May, 2012 Class and Component milk prices were announced on May 31. 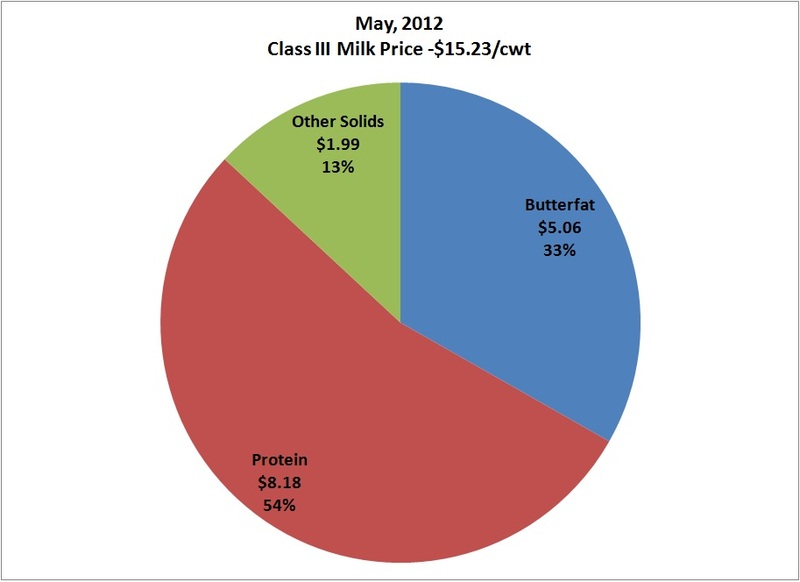 After two months at $15.72/cwt, Class III milk prices dropped in May to $15.23/cwt. 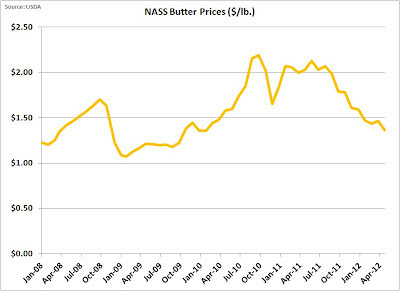 The biggest contributor was the drop in the price of "other solids" which saw a significant drop, from $.41/lb to $.35/lb. 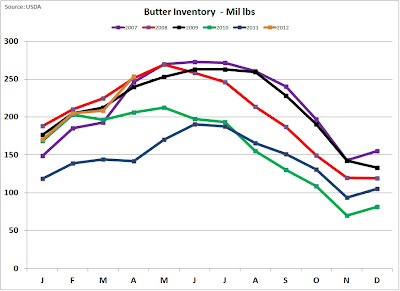 Butterfat also saw a significant decline from $1.56/lb in April to $1.45/lb in May. 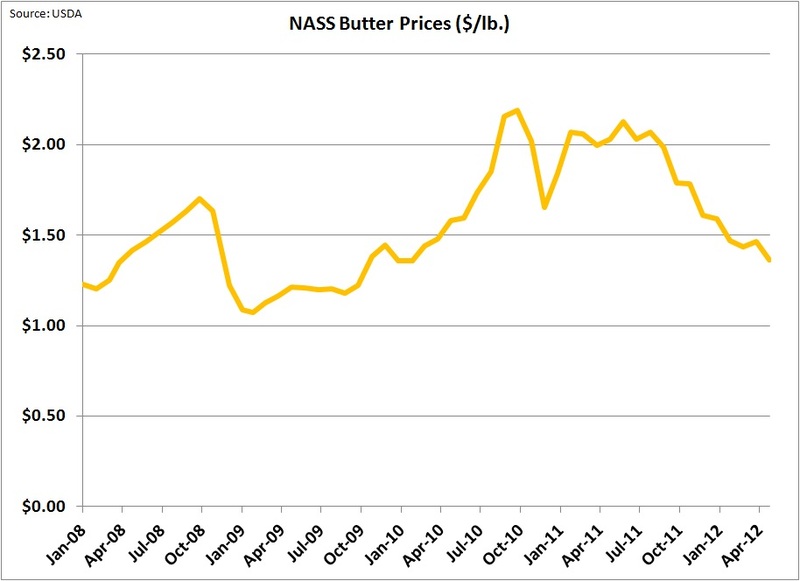 Protein increased from $2.66/lb to $2.73/lb. These changes were driven by a drop in the price of cheese, butter, and dry whey; the three drivers of the Class III milk price. The most impactful component change was dry whey. Typically, "other solids" has a small impact because it is low in value, but during 2011, other solids increased significantly in value more than doubling to where it does have an impact. The value of other solids now seems to be falling back to historical levels. As a result of these changes, protein now accounts for 54% of milk payment. For a producer trying to maximize revenue, nothing is more important than high levels of milk protein. Balancing of dairy feed for amino acids is an important factor in maximizing milk protein and formulating dairy rations for amino acids is being done by more and more nutritionists to help producers increase revenue. As usual, the price changes were largely driven by changes in exports which are influenced by exchange rates. 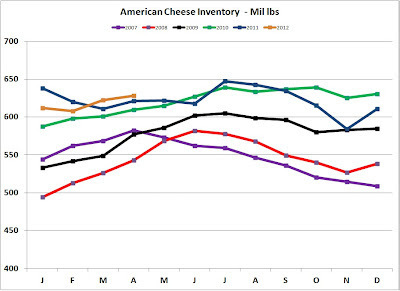 In the sections below, cheese, butter, dry whey, and exchange rates will be analyzed in some detail. 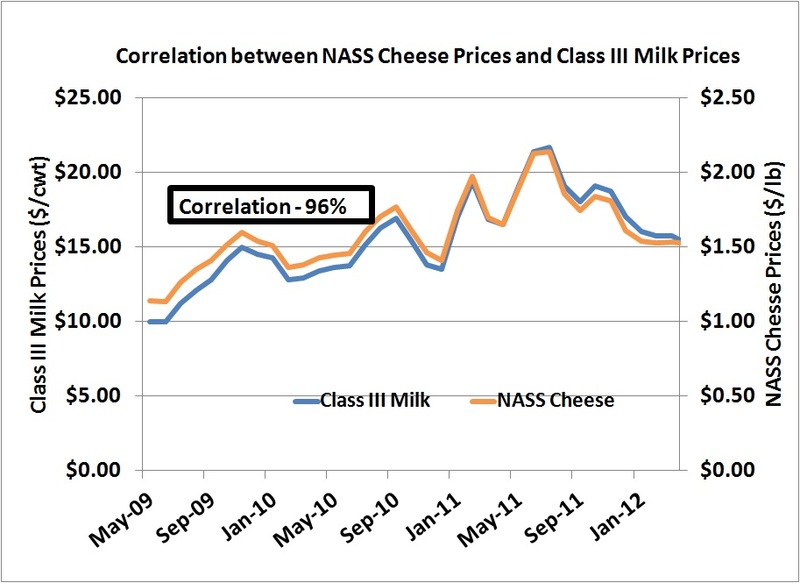 The chart below is shown as a reminder of the close correlation between the NASS price of cheese and the Class III milk price. 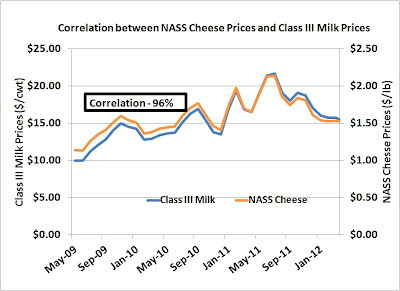 Clearly, cheese prices are very closely linked to the Class III milk price. This was also shown mathematically in an earlier post to this blog. 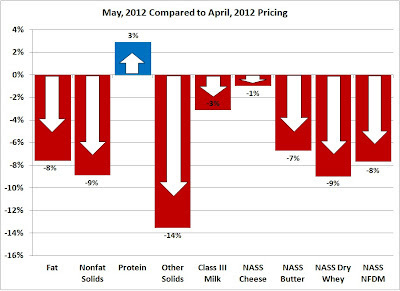 The price of cheese varied very little between April and May, down about 1%. 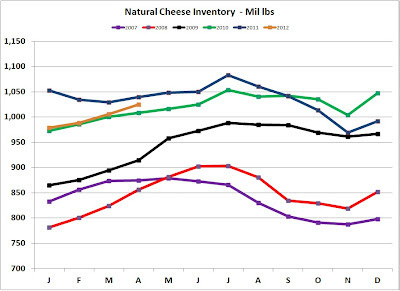 As the inventory chart below illustrates, inventory levels have not appreciably changed. However, cheese production has increased at a pace higher than the normal increase caused by consumption. 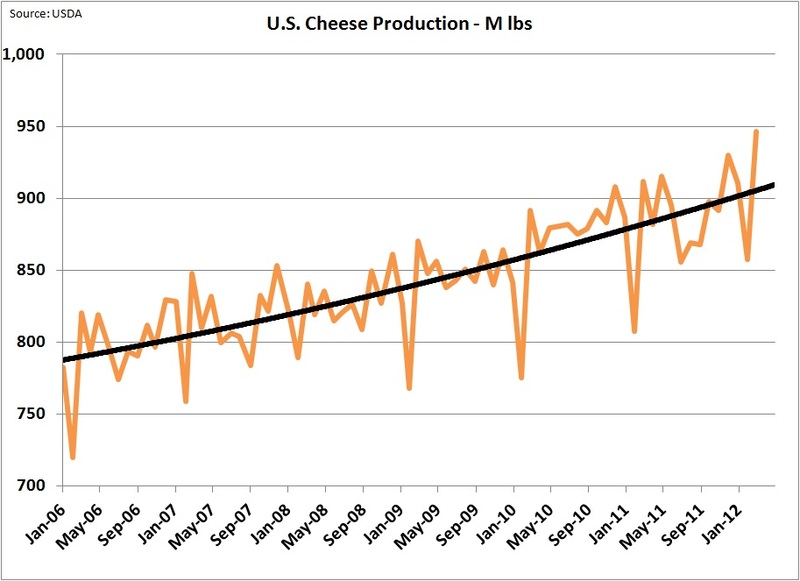 In May, cheese production hit another record high. 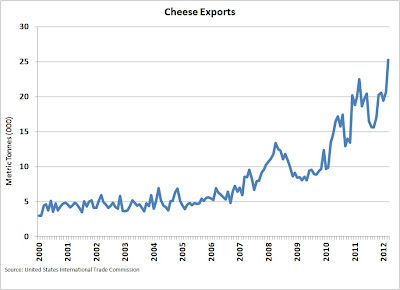 The most important reason that cheese inventories have not grown is the continued very strong export market. This has occurred in spite of an increasingly strong value for the U.S. Dollar vs. other currencies. 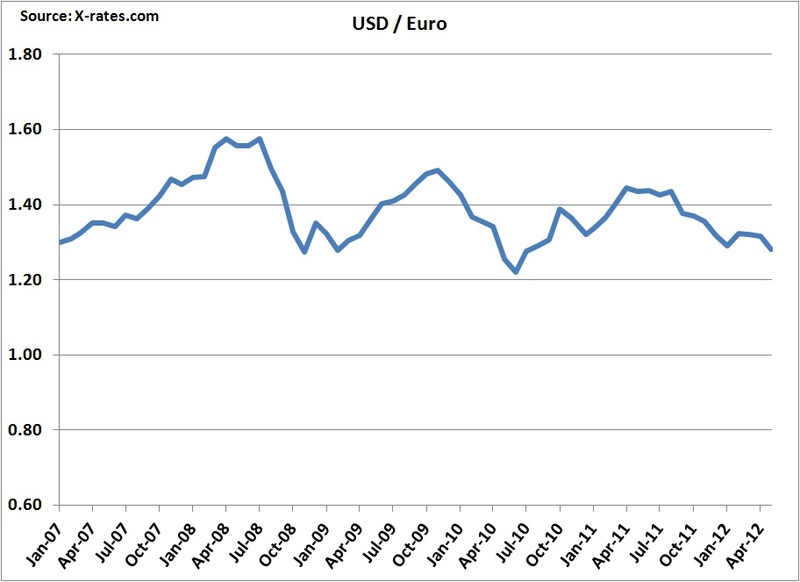 Charts on exchange rates are shown in the last section of this post. 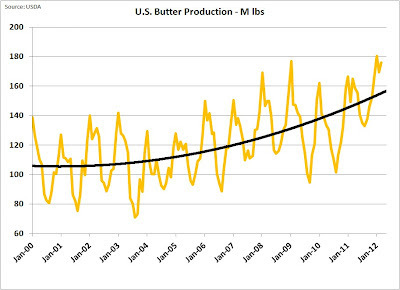 Butter production has returned to normal levels after a period of very low production in 2010/11. 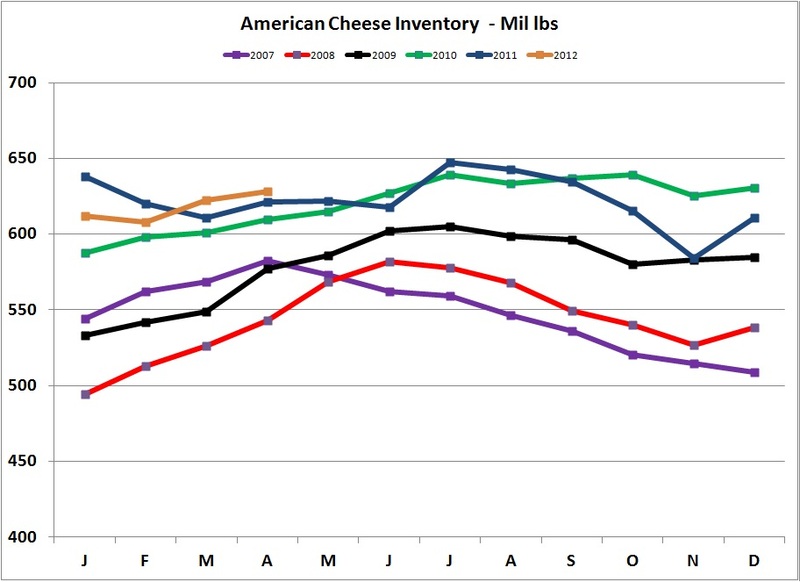 And, as a result of the increased production, inventories have recovered to normal levels. 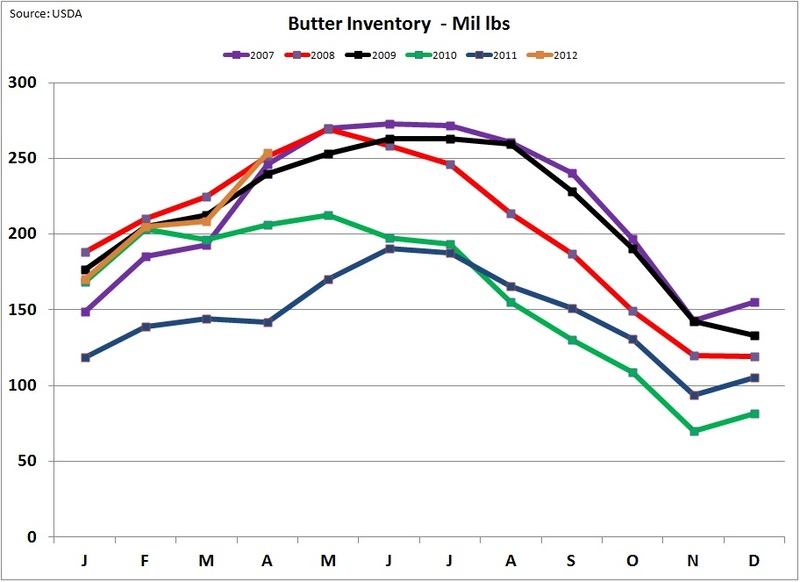 True to the economics of supply and demand, the high butter prices seen in 2010/11 have fallen back to the normal levels around $1.50/lb. 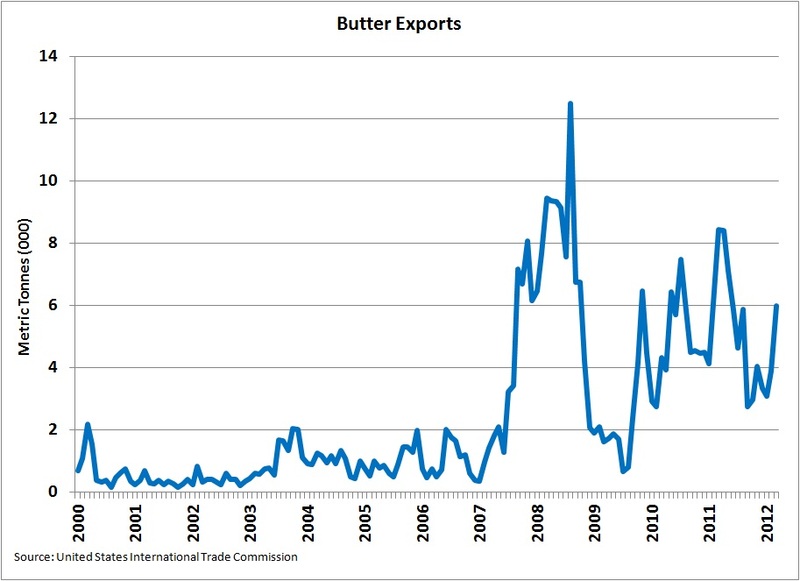 Butter exports have not had a major impact and have not escalated like cheese exports. 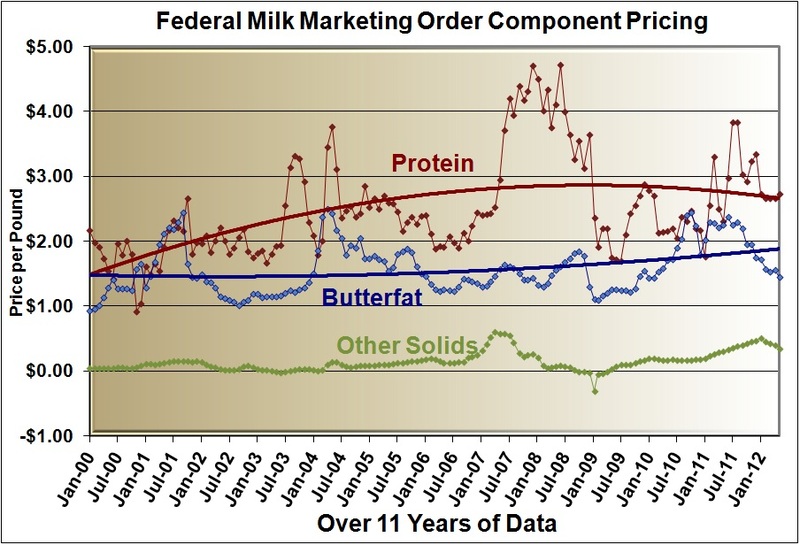 Dry whey prices are not usually discussed in this blog as they do not usually have much of an impact on Class III milk prices. 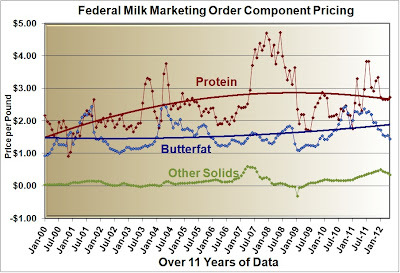 Dry whey prices are the sole variable in determining the price of "other solids" in milk. 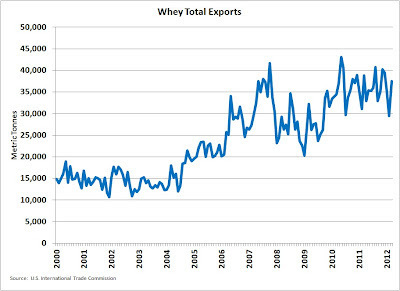 Current data on domestic consumption of whey is not available. 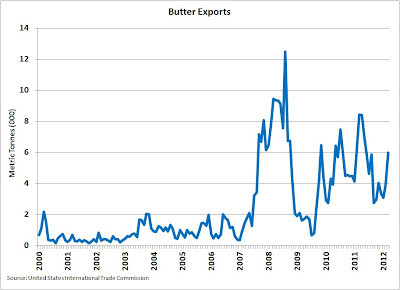 However, export data would support that there was increased demand in 2010 and early 2011, but there were no further increases in late 2011 or 2012. With the supply of whey growing with cheese production and no increase in demand, whey prices have declined consistently in 2012. The trend may continue unless there is change in the fundamentals. Exchange rates have a huge influence on exports. 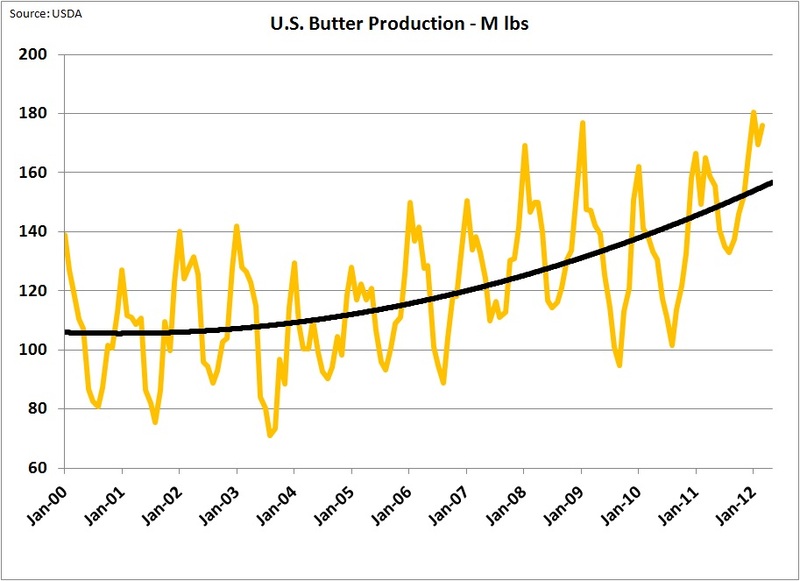 As the USD strengthens relative to the Euro and the New Zealand Dollar, U.S. dairy products become relatively more expensive on the international market. 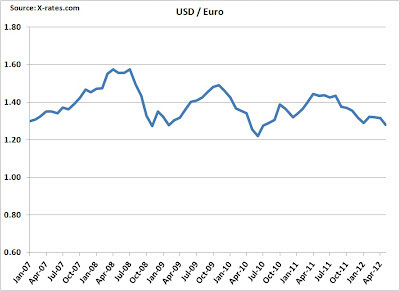 In 2011, the Euro has weakened with the financial turmoil in Europe. The financial turmoil is getting worse, and a continued decline can be expected at least in the short term. 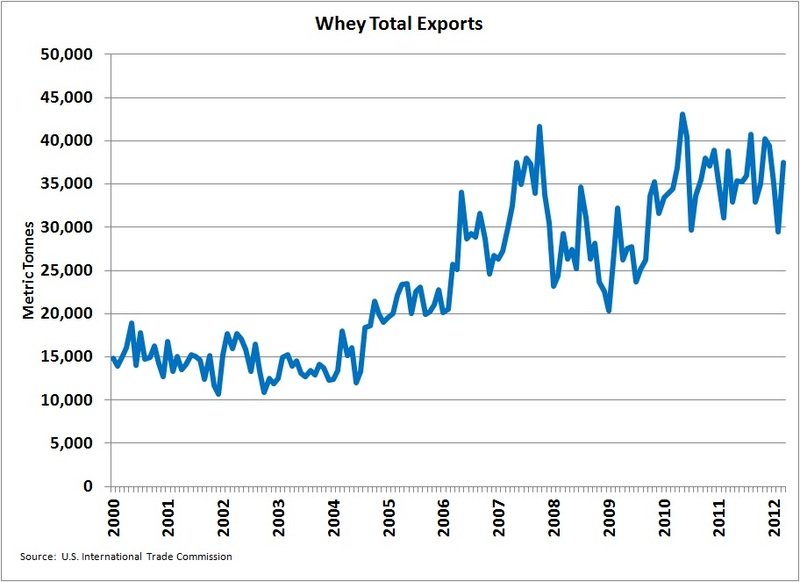 The other currency of interest to the dairy industry is the New Zealand Dollar. 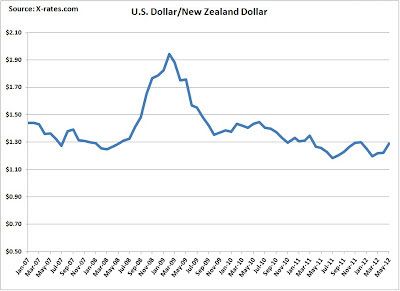 When the New Zealand Dollar spiked in 2008 and then fell, it created a short period of extremely high U.S. milk prices followed by a huge drop. 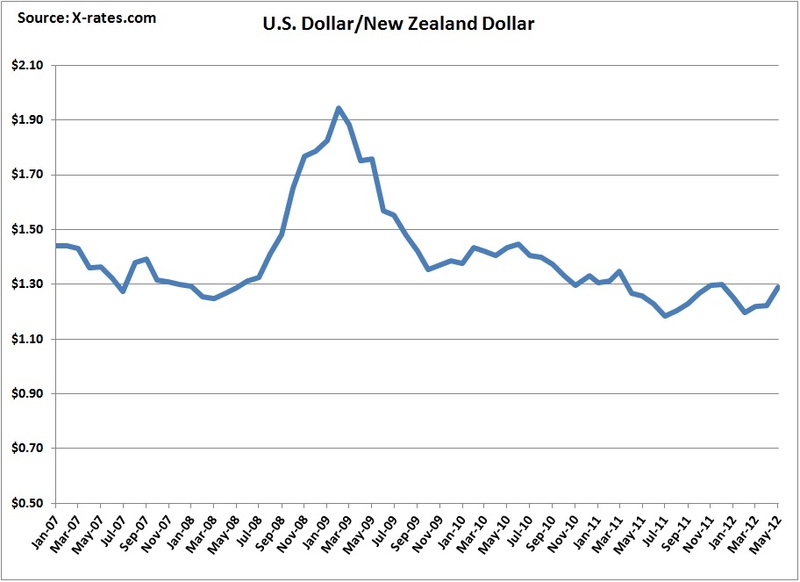 There has been relative stability since 2009, but there is a slow trend to a weaker New Zealsnd Dollar. 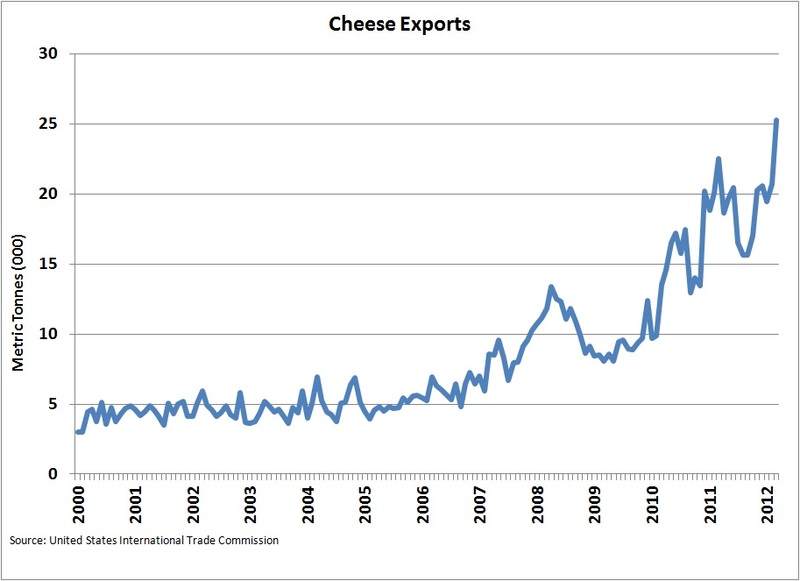 In spite of the stronger USD, exports of cheese have remained robust. If these export increases can be maintained, they will have a positive impact on Class III milk prices and especially milk protein prices.